Before NRP Certification Online, I had to take two days off from work every time my NRP certification was up for renewal. Thanks! 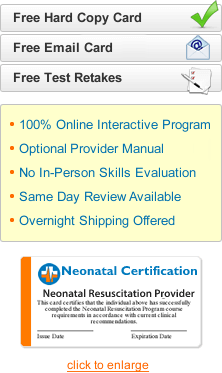 I was able to complete the exam in just a couple of hours through this online program. I was blown away on how the online exam was so straight forward and congruent with what I've learned in the classroom NRP training I've had in the past. I've referred this NRP online program to all of my colleagues. The customer service is unbeatable!